In her most recent post on Twitter, 2NE1's Park Bom shared a farewell message to the group's fans. 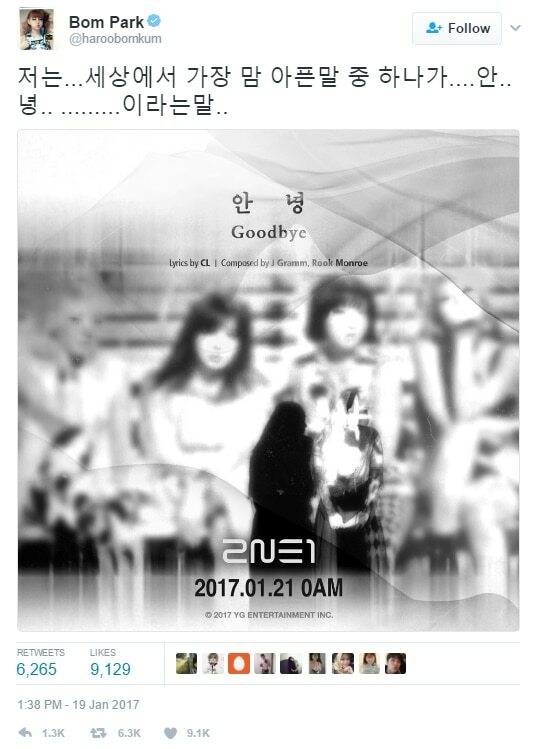 As 2NE1 prepares for the January 21 release of the group's final song titled "Goodbye," Bom airs out her sentiment over the issue. "For me...one of the most hurtful things to say is...the phrase...good...bye..." she said in her tweet along with the teaser image for "Goodbye." In a previous post, Bom promised her supporters that she will continue to sing. YG Entertainment officially announced the disbandment of 2NE1 last November.